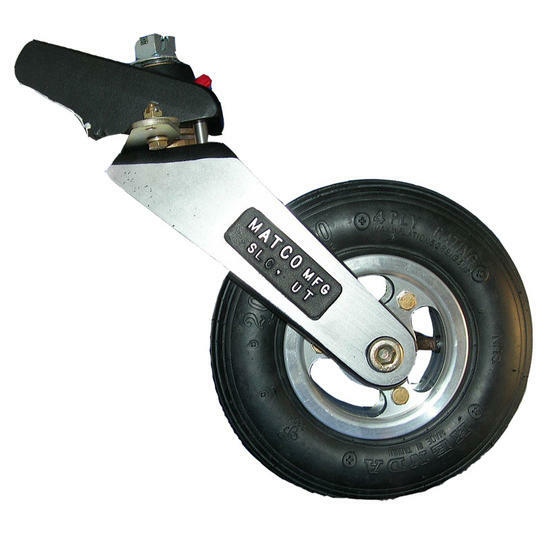 MATCO mfg produces an superior eigth inch tail wheel for use with tail dragger aircraft which require a light weight tail wheel with an 8 inch diameter tire--the T-8L. The T-8L tail wheel has an eight inch pneumatic tire and an overall length of 11.2 inches.Maximum width of this tail wheel with fully splayed arms is 9.29 inches and overall height is 11.3 inches.This assembly with pneumatic tire, tube, and wheel weighs 5.7 pounds. The T- 8L tail wheel has a .625 precision sealed ball bearing which is rigorously tested and designed to resist bearing fatigue providing a long bearing life. The pneumatic tire provides a most silent and smooth ride even when compared to our already smooth WHLT-6 solid wheel model. The true 8 inch black tire on this model provides higher air volume than the six inch tire and tube of the WHLT-6P providing more constant tire pressure. The arms and wings of the tail wheel fork assembly are composed of 4130 which is heat treated to a Rockwell 38-43 to ensure strength and are irridited to prevent corrosion. The tail wheel base and forks are cast and then black anodized to prevent corrosion as well. The T-8L tail wheel incorporates a geometric release mechanism that allows the wheel to caster after reaching a steered angle of 40 degrees (earlier release available with optional steering arms WHLT-03A). This allows the tail wheel assembly to be steerable and full swiveling and provides easy installation with variant spring tension.This wheel has been designed to release with light spring tension and can accomodate either a 1.25 or 1.50 wide flat spring (Use part number WHLTWB-1 adapter for 1.75 inch wide springs). When a 1.50 inch spring is used, a .25 inch spacer should be used between the base and the spring.The assembly should be mounted on the flat spring so that the pivoting axle is as close to vertical as possible when the plane is loaded. All assembly bushings are made of oil impregnated brass so only routine lubrication is needed during the life of the tail wheel.The ball bearings in the wheel assembly are sealed and do not require lubrication either.In addition, the vertical axle has been redesigned to .625 for added strength and durability. The T-8L has a 3.7 inch aluminum wheel that uses an 8 inch pneumatic tire & tube and has an operating load of 200 pounds. The replacment tire and tube set is part number TIRT200x50ASY.